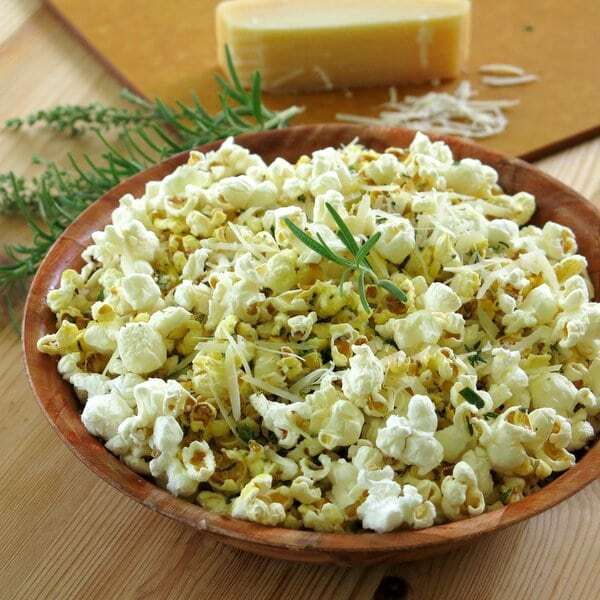 Reach for Savory Popcorn with Parmesan cheese and fresh herbs for a healthier popcorn with lots of flavor…and no butter. August is National Olive Oil month and to celebrate I’ve partnered with Pompeian Olive Oil to bring you this recipe. I took the Pompeian Pledge and left the butter out and used olive oil instead. The result? A healthy snack that was absolutely delicious. Adding fresh herbs gives this recipe a savory dimension. I seasoned the popcorn with fresh rosemary and thyme…this time. But my bucket list includes basil, parsley and lemon rind, Italian spices and chives, all paired with the perfect cheese mixed with olive oil! Olive oil is an easy substitution for butter in so many different types of recipes including baked goods. Check out Pompeian’s butter to olive oil conversion chart and their collection of olive oils which includes Extra Virgin Olive Oil, Special Blends, the premium Varietals Collection to make the perfect swap. Popcorn drizzled with a cheesy olive oil mixture got two enthusiastic thumbs up by some very tough critics…my girls! I loooved the addition of fresh herbs. Either way, this is definitely how we will be eating popcorn from now on! You can take the Pompeian Pledge too! 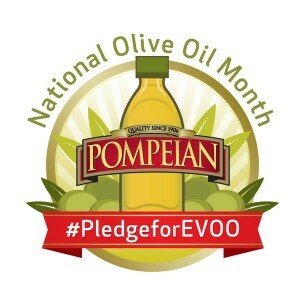 1,000 fans who sign up will be randomly selected to receive a gift from Pompeian (a free movie redemption code and a coupon for a free bottle of olive oil), plus every week 5 additional fans who have pledged will win a fun prize pack on Pompeian’s timeline. What swaps are you going to make? 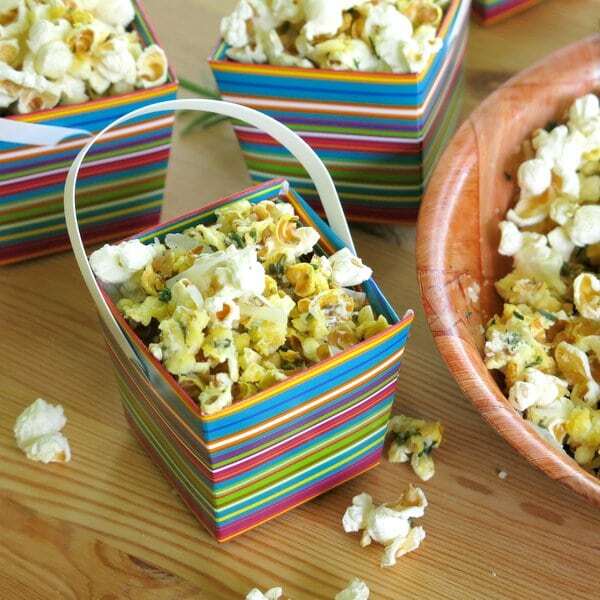 Reach for Savory Popcorn with Parmesan cheese and fresh herbs for a healthier popcorn with lots of flavor...and no butter! 2 Tablespoons finely grated Parmesan cheese plus additional cheese to garnish if desired. Combine olive oil, Parmesan cheese, thyme and rosemary in a small, microwave-safe bowl. Cover bowl and microwave olive oil mixture for 10 - 15 seconds. 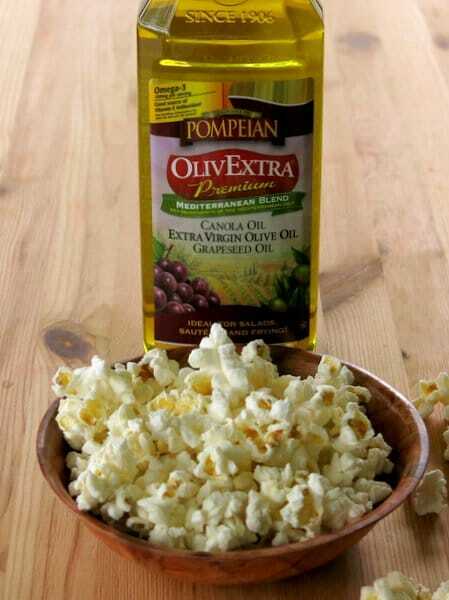 Drizzle olive oil mixture over popcorn and toss to coat. This popcorn looks amazing. My husband will love it, he makes popcorn literally every night! I sooo heart savory popcorn!! Love, love, love this parmesan, rosemary, thyme version. I WOULD eat this for dinner. Every night. I often forget how easy it is to substitute olive oil for butter and oftentimes it tastes even better! Thanks so much for the link to the Pompeian conversion chart – I’m printing it out and putting it on my fridge for reference. My family loves popcorn, especially my hubby. This will go over big at my house. Mmm. This sounds awesome. I love to change up our popcorn routine with different toppings! This is going to be perfect on a lot of occasions. The olive oil sounds like heaven. 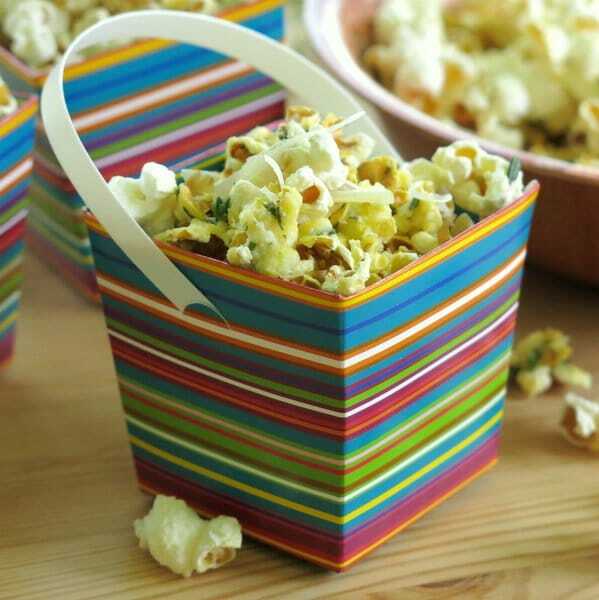 This is my absolute favorite way to eat popcorn! 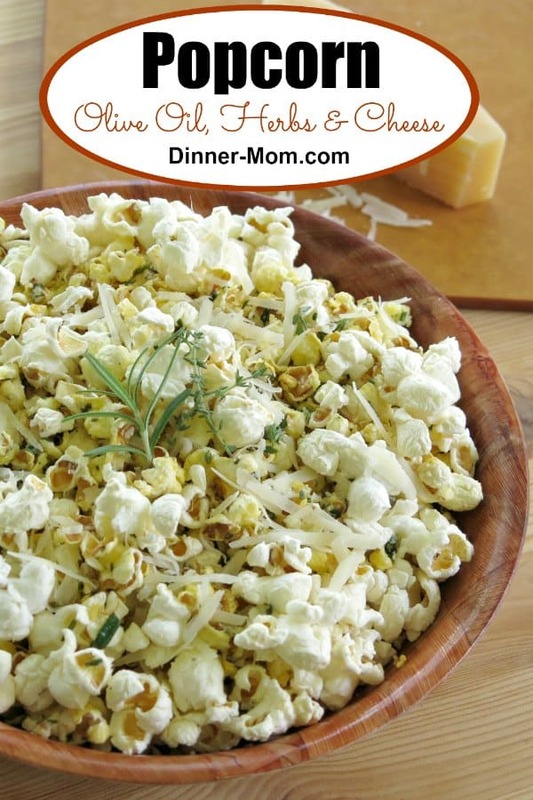 I always put cheese on my popcorn so this recipe is right up my alley! My kids love snacking on all sorts of flavored popcorn varieties. They would love this. 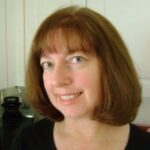 The only gourmet savory popcorn I’ve tried are pepper and white cheddar …. I think parmesan would work so much better and I will be definitely adding herbs… this recipes sounds awesome! This is the absolute best way to eat popcorn. I will never go back to butter again!! !